This specially developed glue is coloured blue and bright yellow to be easily seen and then it dries clear after a few minutes. 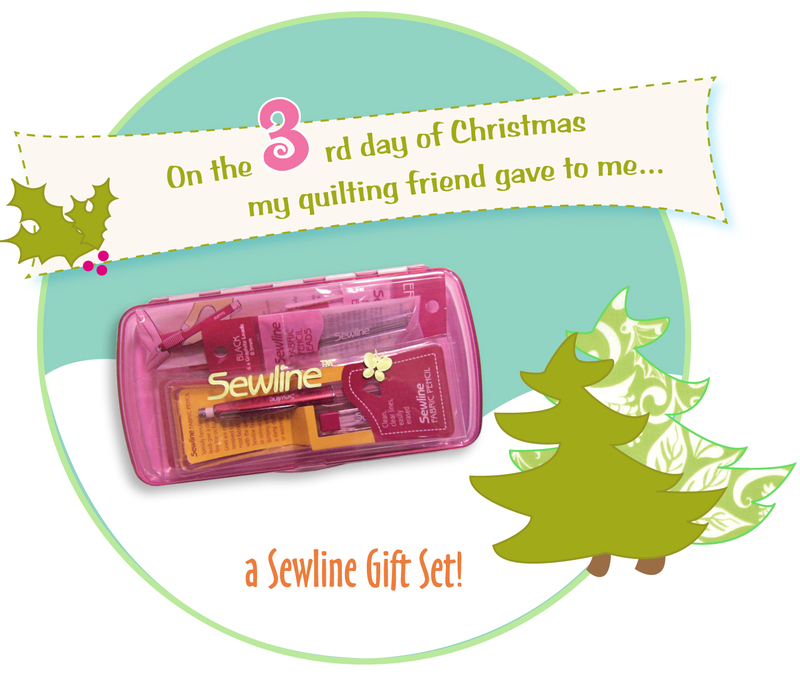 We will be giving away a Sewline Gift Set to one lucky quilter today! Make sure to follow our blog and leave a comment to tell us why YOU want Santa to leave this in your stocking! The winner will be announced tomorrow morning. Love the options of the 3 colors in one to be able to mark from light to dark. This gift set is great! I always run out of a liner. It would really make me really happy to find this in my stocking. These are great tools to have in the quilters toolbox!! Thanks for doing such a fun giveaway. Although I enjoy making a great quilt, most of my sewing time is spent making little girls clothing. This tool will allow me to place all my small pieces with ease! How nice it would be to find it in my stocking this year! Great gift set! Nothing like having the proper tools to do the job right! a quilter can never have enough ways to mark a quilt. I would love this nifty set! Being a fairly new quilter I’ve only used a purple pen to mark – this little kit looks like something I need to “graduate” up too. What a great set! I love good marking tools. They’re such a great help for many different situations. I have yet to find and awesome way to mark a quilt. I think this would do it. Please Santa, can I have one of these. This is so cool. I’m a fool for gadgets, but this one is fab. Go random generator, mama needs a new set of tools! Another one of those “Why didn’t I think of that?” moments! I think I have 10 different pens of various vintages that work or not. It would be nice to consolidate into fewer tools! I could use one of these because I have used regular pencils and then couldn’t remove the marking. Well from some one who makes lots of mistakes along the quilting way this would be a wonderful help! What an awesome little kit to take on retreats or quilting groups. I have been struggling with what to get my Mom…the lady who has it all….she doesnt have this….heading to my LQS this afternoon to see if they have them….thanks for the idea. What a great little kit…the glue especially! I would love to have more of these. I love the way they mark. What a useful stocking stuffer! My dilemma would be whether to give to my sweet, quilting Mom-in-law or keep it for myself. All I ever use are regular pencils, I would love to have something designed for fabric! My father always said “The right tool makes life so much easier!” This looks like one of those tools that would make life easier! This would be a great addition to my sewing kit. What a great kit! I was looking at fabric marking pens and just haven’t seen what I want till now I see this set! I’ve heard great things about Sewline products. Maybe, they would jump start my efforts with stitchery. I want to do stitchery, but keep hitting a wall. I’d be able check my list and check it twice if I had that great set. But probably would mark some quilts for quilting. My stocking is hanging there waiting for Santa! What a great tool to use for every color! I use their glue stick all the time! I love mine and would love to have another to give as a gift!!! Looks like a great addition to my tool box, I’m up for trying anything new to make the “job” easier. I’m kind of a tool fool! I absolutely love their products and have shared these with many people. Perfect stocking stuffer for me. I would like Santa to leave this in my stocking so I can learn how to quilt myself with the best tools. I would love to have this handy dandy little to with me when I quilt. I would love it! I’ve tried a few of the SewLine products. I like all that I’ve tried so far. This looks like a lovely set! This would be wonderful in my stocking! It would get a ton of use between quilting and crafting. Great stocking stuffer.Perfect combo tool set for any busy quilter. Marking with the pen and a glue stick for all my applique pieces. 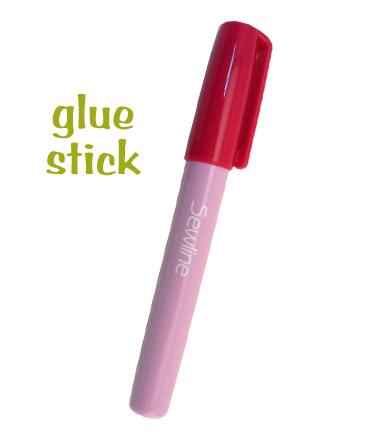 I have a glue stick by Sewline and I love it so would like to try the marking pens. Sewline products are the best. I’d love to win this little box of toys! I love trying out new notions to help me with my quilting and sewing. Thanks for a chance. Oh boy! The perfect stocking stuffer! I’m just not sure it would ever actually make it TO the stocking because I would use it immediately! I would love to find this kit in my stocking. The pen that rotates looks like a great tool. I alrady use the white marking pencil and love it. Oh, this would be great to go along with the used Grace quilting frame I just purchased. Id be all ready to stat quilting some of the MANY tops I have! WOW, this is a neat item! i haven’t seen it before, so i would love to have one to try out. Thanks for the chance to win! This looks like a wonderful stocking stuffer. I do a lot of marking and would love a product that comes out easily. I love the Sewline kit. It would be a great addition to my sewing box that would get used all of the time. This gadget looks so useful! no hunting for individual components so yes please I’d love to find one in my Christmas stocking! I’d love to try these great new tools – good luck to everyone. Looks like a great marking tool! thanks for the giveaway! I would love this set!!! I’ve tried so many marking tools and they always seem to dry out or not work well 🙁 Plus a glue stick for applique and a tracing pen for embroidery =D It’s perfect!!!!! I would love to win this sewline kit:) Thanks for the giveaway! Sewline products are the very best for marking!! I have tow pencils-one with black lead and one with white and I use them ALL the time for ALL my markign!! Don’t know what I would do without them!! You can never have too many notions and good marking tools are critical to sewing well. Thank you for these 12 days of Christmas. Wow!!! What a great gift!!! I was unaware of the glue stick!!!! What a nifty gadget…. I’d love to win this stocking stuffer. I’ve made lots of quilt tops that now need quilting & these marking tools would help. Thanks for the chance to win. I’m a follower. would love this in my stocking! sewline markers are the greatest and mine are wearing out. OH I would really love this set!! Been drooling over one for some time and heard alot of good reviews about it.. I follow your blog! Thanks for a chance! I wish Santa could bring me all those wonderful tools. Thanks. Great marking tool. Stop for me Santa!! I would like it because I love anything that is an organized easy to access set! Would love to find these in my stocking! Love the idea of a sm glue stick. My stocking lacks luster! It sure could use something fun for a change. Fingers crossed here…and looks like a great item for embroidery work! I’m forever using a pencil in my projects. And dealing with unwanted pencil lines! Using a proper tool would be a huge help! I’ve been good Santa…..
Oh, I ‘ve never seen these before, I esp. will need the eraser LOL. I’m already following this blog for quite a while, love the tips etc. The perfect stocking stuffer, all the right tools for marking and working with applique, who wouldn’t love to have that. This would be a great addition to the notions stash! I like the combo-rotating marker. No need to hunt for the right tool..it’s there! Thanks! This is the kind of item that I would love to own, but won’t buy it for myself. I would LOVE to receive it, however!!! I would LOVE to have the Sewline gift set in my stocking – it would be great to have all the proper marking tools – and these look so much better and efficient than the dull pencil I usually grab! Sweet! They really did pack a lot into this kit! I think every quilter would love to have this in their stocking this Christmas, I know that I would! This would be wonderful! I’m teaching myself how to appliqué and I’ve just discovered Sewline (recommended by my local shop). I HOPE I HOPE I HOPE! Thank you! this looks like a fantastic tool – would love it! I would love this! I do all my marking for cutting now with a chalk marker! I love all the sewline products. They have made my life easier. A great gadget!! Would love to have it in my stocking! i am always looking for a great marking tool. need this in my stocking. thnaks. What fun, I haven’t had any of these tools. Looks like Santa better put this in my stocking this year. This kit would be so handy to have! I am always looking for the best way to mark my quilts. Thanks for the giveaway! I already had this on my list for Santa to bring, have been eyeballing it at the Quilt Shop for a while! I would love to win this set of tools, especially the marking pencil w/3 tips. I use them for making soft sculpture toys and quilting. thanks for the giveaway!! I am always searching for the perfect marking tool. this looks like it would do the trick! “3 in 1″…will be useful in so many ways! I have this and agree it would make an excellent stocking stuffer, or a gift to a quilty friend. Marking quilts is always a problem for me. I’ve tried a few different products, but nothing really works that well. Would love to have this little stocking stuffer trio. The glue stick looks very interesting. These tools sound like they will help me with do things more efficiently – the things that take me the longest and I find the most frustrating – like pinning fabric, finding a marking pen that works and is the correct color, etc.!!! These would be magnificent tools for me! I could use a new pack of the black leads for my pencil, and the eraser. I use this often, not only for quilting but also for garment sewing. It’s a great marking tool. Would love to win. I would be thrilled to win this giveaway! I love notions and these tools would be perfect for applique! These marking tools are the BEST and I would love to win a set!!! What a great little kit of awesome tool. I LOVE all the gadgets I can find, as long as they are quality and work. Sewline from what I’ve seen so far work great. I have one ceramic pencil which is by Sewline and it’s the only marking pencil I’ve liked so far. I’d love to have more of their marking pencils. 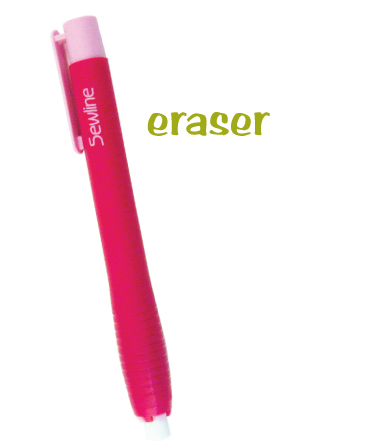 The ones that can erase or be removed with water by Sewline are ones I’ve wanted to try. I’ve given up buying the blue disappearing ones because they dry out before I use them more than about three times. I really like the Sewline trio has added the blank to mark indentations on the fabric. That sounds very useful. I love that all these wonderful tools come in a beautiful gift set. I am going to be on the search for a couple of these for christmas gifts. This is a dandy little kit. I love the marking tools and the fact they are in a bag so they won’t (shouldn’t) get misplaced. I love these tools and would make and awesome gift to a quilter.Thanks for the chance. This kit would be a great tool as I learn to do machine quilting! Great assortment of tools in this kit! I have been wanting to try the Sewline products since I first read about them a year ago or so:) These would be such a treat for me to receive. Would love to have Santa leave these in my stocking, because, I’ve been a GOOD GIRL this year. Sewline really has a wonderful product there. Looks like a great set of tools, would be a great help to me!! Pick me! I would love to find these under my Christmas tree. They would be so handy to have. Santa, I have been a very good guilter this year. Wow, I really could have used this yesterday when I was drawing a diagonal line on 400+ squares! This would be a GREAT quilters stocking stuffer too! I’m a stickler for accuracy and mark a lot – these would be so awesome! If they were the only thing in my stocking come Christmas morning, I would be a happy quilter. I’ve been good all year and sew I would love to have a Sewline Gift Set to make marking my quilts sew easy. What a tool! Everything together. What an innovative set of tools! I could sure use a stocking stuffer like that. Very neat little tool!! Sure would come in handy doing some quilting this winter 🙂 And looks sooo pretty too! I always need things that can do more then one job! It’d be nice to only have to find one thing! I’m always looking for the perfect marker. This one looks like it might be the one. I would love to have Santa put the Sew Line in my stocking because I have them and use them all the time. I would love to have a second set so I could keep my set at home and pack the other in my retreat kit. I end up sharing alot of stuff at retreats and some stuff never makes it home. Winning this … I would totally share with my friends!! Wonderful analogy with the wording!! I’d love to own the sew line set – it’s such a versatile kit to help you along. What a nice stocking filler. MY stocking of course! I’m always looking for a fabric pencil/marker. Thanks for the giveaway! I have heard such good things about these Sewline Marking tools and the glue pen. I have been meaning to pickup one of the glue pens, since I love to do appliqué. The glue pen is perfect for this! So, please include me in the giveaway! Oh, and I am following the Moda Cutting Table blog. It’s sew nice to have your lines marked and visible to get accurate peicing. Well I need to! Thanks for the giveaway! I am a follower too. What a great marking set for quilting! Thanks for the chance to win! Oh man I could really use that! It may have to go on my Christmas list anyways, just in case. This would be great, it’s so hard to mark a quilt in the south and it stay on for awhile! Usually the humidity takes the marks right out!!! Would love to try it! Looks like the best way to mark a quilt, thanks. The Sewline kit looks fantastic. I saw a demo of these items and am saving up to buy them. Please pick me so I can use the money to buy something else that I really want. The Sewline kit would be great to add to my quilting tote to take to monthly quilting get-togethers. Thanks for the giveaway! Lana D.
This is really clever. I love things that are multipurpose! Marking tools are such a vital part of making a quilt and I am always on the hunt for the perfect one-the slimline system looks like it sure could fit the bill! Having great marking tools is essential. Would love to have this in my stocking!! With a kit like this, I would never be “lost” for tools. Thank you, Santa; I have a plate of cookies for you. As a long arm quilter. I am always looking for the removable marking pen that leaves not a trace. Sewline puts out a terrific product. I love the Sewline product line, they seem to be so well thought out by people that actually use them, so I would love it if Santa could hand this over! I love the Sewline products. This is a new one to me and it looks fabulous! I’ve heard these are marvelous products and the pens are always sharpened. It would be fantastic having marking pens that are ready to go everytime and do not leave wide marks. Dear Santa Mama Moda, Please place a Sewline gift set in my stocking so I can mark my stitching lines. My hand quilting is sew very crooked and number two pencil marks are messy. It sure would help me if had a straight Sewline to follow. Thanks Santa Mama Moda! What a great set of tools. Thanks for the chance to win. I would love to find this in my stocking ’cause I want Santa to leave only “quilt-y” things in it this year! Thanks for the giveaway! Planning to have a stitchin Christmas this year so I definitely need this set. I’ve never seen that range over here in NZ, would love to have the chance to give it a go. This looks so cool! I would put this to good use. I would love to win this stocking stuffer. I love the glue pen and use it a lot with wool applique. I would love to try your marker which sounds great because it has both colors of lead. A good set of marking tools is a great thing to have. Oh I could have done with this yesterday when I was making mitred corners. It would have been perfect. It’s always handy to have a marking pen. Oh Santa this year I want to make my Baltimore Christmas Quilt but I don’t have the right marking pens to mark for the applique. It sure would make it easy for me to start if I had this little bundle in my stocking! I do a LOT of hand applique work and I would love to use this set. Other marking tools don’t keep their points and with the leads being the same thickness, this would be ideal and can be used on any fabric! 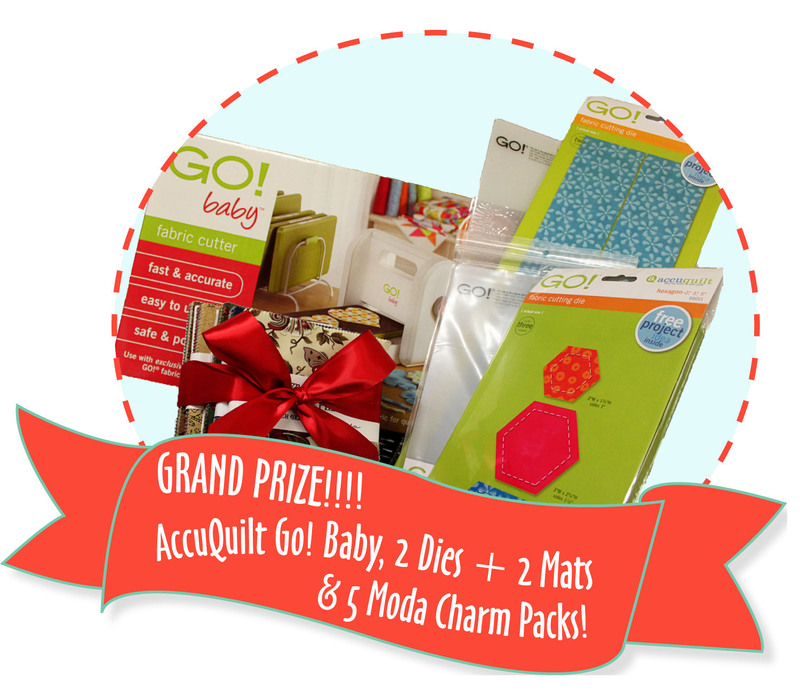 I would SEW love to win this Give Away…I would like to try the Glue stick out on my Apple Cores, Hexagons and Clam Shells!!! And the pens would really be useful for marking my quilting lines!! Ohhhhh yes this GA would really come in handy!! Thanks SEW much for the chance to win…and yes of course I follow!!! I already have one of the Sewline pencils and love it! I could see so many uses for the others too. I’d especially like to try the roller tracer and the glue pen. What a great little kit, I do hope I win, I would get so much use from these. I don’t have a good way to mark on dark fabrics, so trying out that white lead would be something I want to try. Santa can bring them all right on over. I follow the blog and I think the Sewline pencil would be a great addition to my quilting supplies!! also looking for some new gadget to make quilting easier!! I’m a follower. Those would fit nicely in my stocking and come in quite handy in my crafty adventures. Thanks for sharing! A definitely need a new marker for fabric! I really like the idea of a marker that comes off easily. I’ve tried many different kinds, some are okay and some are horrible. I’d love to try this one, it certainly sounds like a winner! Oh I do want this in my stocking. I love sewline! Great product for any quilter. These look like some great products. I am always willing to try something new, to help with my quilting endevours. I just love the Sewline gift set. I have one pencil and use it all the time. Would love to try the other products! NEAT GIVEAWAY! JUST RIGHT FOR GIFT-GIVING OR PERSONAL QUILTING USE! Tools are good. Pink is good. Ooooh, new marking tools. Great! I love the fi e pt. glue stick. This would be sweet to win! Would love this kit as I always have trouble marking. This would really help! Thanks for the chance. I seem to be doing more and more embroidery these days … this gift would make life so much easier. Haven’t seen the blank roller marker before. Would love this kit. I am always so afraid to mess up my fabric, I mark most everything with chalk. What a wonderful tool to add to my quilting tools. This would be great every time I need to mark something on my fabrics. I love to do redwork and various other kinds of stitcheries. These markers would work beautifully for this! Have a blessed day!! A three in one marking pencil sounds like a great notion to have in that sewing basket! Very versatile! How cool! I have a similar pencil but now I feel slighted that it only uses one color at a time! Great gift set! When I embroider a project, I need good marking tools! Would love to win this one! Just starting another quilt now and the last one I had such a hard time marking my quilting lines as I hand quilt. The soft grip feature really appeals to me. I love the sewline marking tools and love my sewline pencil. I’m always working on more than one project at a time though and would be great to have extra to pit with each project! I love the glue stick. I use it for English paper piecing. Wowie! 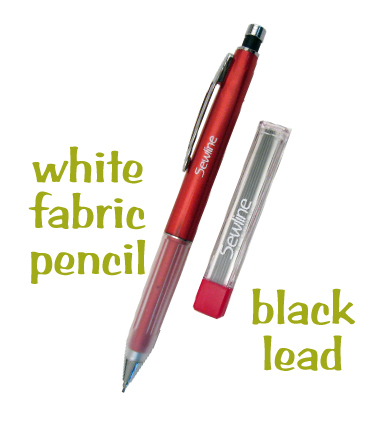 I love my sewline glue stick but I’ve never seen the three in one pen – very cool. I would love to win these marking tools. I think they would be great for marking for hand quilting. I’m a follower. I would LOVE this sew line marking kit for Christmas. Just today I was marking quilting lines with chalk, which left white powder all over my sewing machine and was difficult to remove from my fabric. Then I read this blog. Wow, this sounds so great! I’m completely addicted to sewline glue and to win another pen and decent pencils would be a Christmas dream come true. Santa… The Sewline kit would be helpful marking quilts and prepping for applique work. I need these marking pens, they look like just what I need and the glue pen. what a fantastic tool, i would get lots of use out of that. i thought this was a neat little notion pack. Who couldn’t use more notions? I love this! I think it’s a must have for every sewing room! Love this tool~~~~all in one!!! I could use some markers for fabric! thanks for the fun giveaways. I am a follower! This looks like a great little kit…especially love the glue stick! What a wonderful set of tools! I’m never sure what is the best way to mark a quilt since I’m fairly new at quilting! It would be a great gift in my stocking! What a sweet set of little tools. What great tools 🙂 I am a gadget girl and love getting new toys. Love a good marking system! I would love this kit! I can use the pen to mark my quilts when machine quilting…..please pick me! I’d love to win this pencil set. I think it would be great for marking my appliqué. What a neat gift idea! I would love to have one in my stocking! Thanks Moda! These tools look great! I love marking diagonal lines on my quilt tops before pinning them. Then I can baste and quilt without removing pins. I’d sure love using these new ones instead of my old, dried out markers! Thanks for the giveaway! Wow how handy, and I love the little case it all comes in! Would love to win this to see if it is the marking solution I’ve been looking for! I have a lot of problems with marking tools, so these look like they would be good ones. Would love to see it in my Christmas stocking (or before). What I have tried of Sewline has been wonderful – why not the whole kit and kaoodle – and the case is to die for – please enter me. PS – I have been/am a follower. Thanks for all the fun you send my way! I just signed up to be a follower. I need to upgrade my marking tools & this Sewline set of a marker, refills, glue, eraser etc. would definitely fit the bill. So convenient. Tools I could not live without for my quilting, great gifts I would love to have and give! I love any marking tools that make my job easier. Please Santa, bring me this for Christmas. I would love those tools. I am a beginner quilter, so I think this is something that would help me a lot. This would be great! So useful! I would love to win this kit. I have just started designing embroidery patterns and this would be helpful. Thank you for the giveaways. Looks like a fun gadget to have! As much as I sew, I think I would get a lot of use out of this kit. What a neat and useful giveaway! What a nifty little kit. Would love to have that in my stocking. I would love to try these out. Thanks for the chance to win. Wow! I’d really like to try those tools out. Thanks for a chance. wow, i could destash a number of marking tools with this baby in my house. Great tool set, love the items being presented, especially this marking tool. I would love to find this in my stocking on Christmas Day so I could use it to mark my quilt for machine quilting. I also have a couple of new embroidery patterns that this would be great to trace with. Thanks so much for a chance to win! I like to try all the marking tools. I need to find the perfect one. Fan4may at aol dot com. Great gadget!! Would love to find this in my stocking. I could use some nice marking tools to finish my quilts. Not only would this prize help in marking quilt projects, but other crafting projects as well. Please Santa, I’ve been really good this year. Id luv to find this in my stocking for all the Totes and Bags I make, Thanks for the chance to win! Happy Holidays!!! What a great marking kit. Can never have too many markers! This would be a wonderful set to use! I would love to find this in my stocking! I am at a loss when it comes to having the right tools to mark my quilts. Thanks for the great giveaway. What a fun little tool! I hav never seen one and would love to try it out! I follow through Google Reader and I love these products! They need to appear in my stocking because I would just like to try these out! I have a sewline pen and it’s great. I am only able to find the green refills, I would love to have three colours in one pen. I could really use this. I want santa to leave this in my stocking because i just started sewing for a hobby. I am slowly purchasing a few things here and there, but still need alot. This would be awesome! I have never tried SewLine products but it seems quite convenient to have all the marking pens you could need in one place. It can be quite frustrating to have multiple pens all over the place when using both light and dark fabrics. I would love to try this line of products. What great products. I know I would get lots of use out of them if I am lucky enough to win. Great marking tools always have a welcome spot in my tool box. I hope it’s not too late to enter. I would love to win that kit! I tried to send a comment on this last night but got an error message. Anyway congrats to the winner! What a great set of tools! This looks like one of those tools a quilter should not be without! I’ve seen this pencil on many different sites & would love to try it out…thanks! What a useful tool. So sorry I missed the contest for it. What a great combination of tools! Would love to have them. I missed the give away but I still would like to post. Thank you for the great ideas of tool I might need. It would be wonderful to have this toolkit in my possession. I have been ogling the Sewline in the stores. Late to the Blog hop – but I’d sure love to find this set under the Christmas tree ! This kit sounds so handy! I wish I had one! I am purchasing a few of these for friends! What a great stocking stuffer gift this is! Fabric markers – I never have enough. O.K. This was my wish last year! And no, I did not get it! I must not be assertive enough around my family with what I really want for Christmas. Why can’t they read lists??? Bah Humbug! This is a must for everyone’s stocking!!! Wow, that is one amazing pen!! I am leaving a comment to enter to win! I need to fill a sewing room! I have most of these sewline products. The kit is really nice. This is such a great took kit to own. I just did a search to locate one and have now added this to my wish list on Amazon. Thanks for showing us this kit. I never knew we could get all the great Sewline tools in one kit like this. What a handy kit! I’m always looking for markers that can be easily erased and I hate pins so would love to try out the glue! I will be buying one of these pencils..thanks Moda. I love this because the tiny pieces of chalk I’ve been using are just done!